Last Saturday was a beautiful sunny day; the skies were bright blue and criss-crossed with fluffy white vapour trails from all the aircraft activity. Me? I was stuck in the office installing a new computer and experiencing all the pain and panic that goes along with that – it went (almost) without hitch! Sunday I shall be in the garden for the whole day I told myself, as if in reward. Sunday – rain, wind, rain! I’m having a bit of a re-vamp in the garden borders, so I set to stripping out old material from the borders but the rain and wind defeated me. The under-gardener looked worried, he knew what was coming! “I (for I read we) need to go to the garden centre for more compost and plants” I said in a soft tone to him. I promises him coffee and cake. October is a lovely garden month, with autumnal colour making a first appearance on the leaves. Remember a couple of weeks ago I mentioned planted spuds for Christmas? Blimey, they are up and at it already! I made two plantings of three spuds in each bag a couple of weeks apart, which should give me a succession. Should! If you have planted some ‘new’ spuds for Christmas do remember that any frost will kill the haulms and that will be game over – so ensure you get them into a greenhouse or shelter somewhere when Jack turns up. I will be putting mine into an unheated greenhouse and laying horticultural fleece over them if frost is forecast. Now is a perfect time for getting garlic in the ground. Garlic benefits so much from frost, this is what helps with the separation of the cloves. Sow seed of broad beans and peas towards the end of October for an early crop next spring. Spring cabbages will be ready for planting out, ensure you net these otherwise the pigeons will be at the table before you get to eat any! Bulbs – still time to get your spring bulbs in. One January I found a bag of daffodils lying in the back of the shed, which hadn’t made it into the ground the previous autumn – I planted them anyway, I like a challenge … the flowers were stunning. So don’t ever become a slave to the gardening calendar! Sweet peas – there is still time to make a sowing for over-wintering, giving you a head start on flowers early next spring. If you had sown parsnips early in the year try to leave them in the ground till after the frosts, they will be all the more sweet for this. 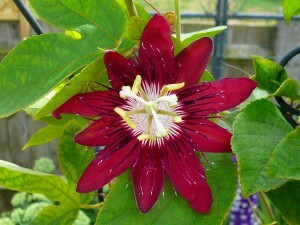 Passiflora ‘Lady Margaret’ is looking good. This variety has a beautiful rich colour and it is supposed to have a lovely perfume but mine must have been last in the queue for that! 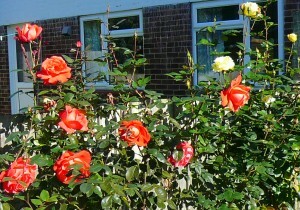 The delightful orange and yellow roses I inherited have put on a fabulous second showing. I bury banana skins into the soil around the base of these, clearly they like bananas. 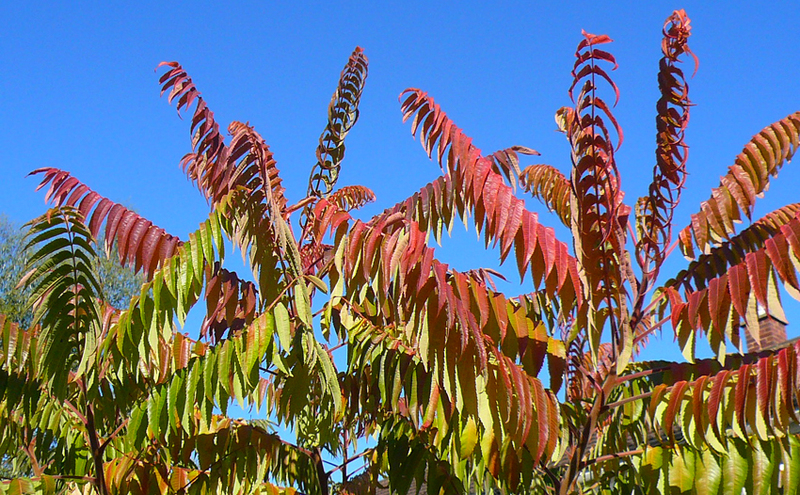 Somewhere along the way in the life of this military quarter there has been a gardener living here – because in addition to the glorious roses, this Rhus is well established and is fabulous. Whoever you are gardener-of-military-quarter I thank you for these treasures. 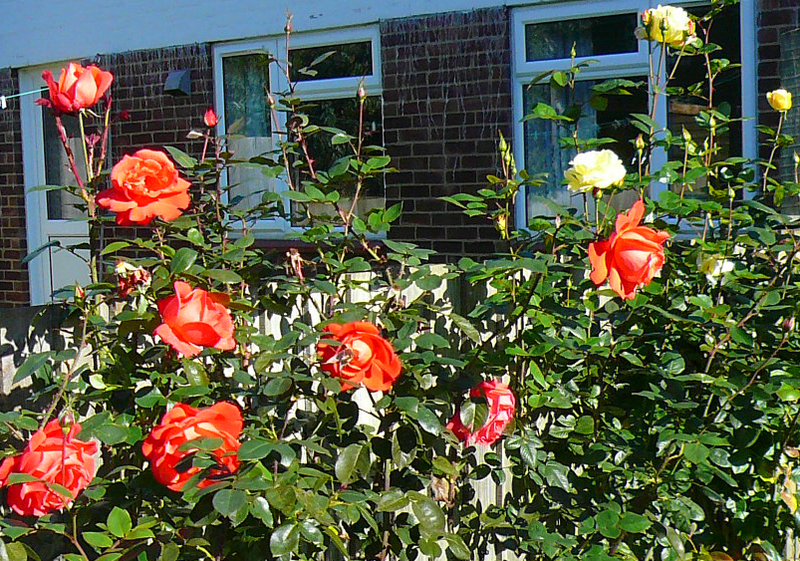 This entry was posted in autumn garden, Christmas potatoes, rhus, roses. Bookmark the permalink.